Illustrated by Emily Daly, this is the third children's picture book from mother-daughter team Jo and Jess which follows the adventures of Jess the Goth Fairy. Meet Jess the Goth Fairy’s family. Jess loves her nan so much, but recently she’s been unwell and this makes Jess very sad. With the help of Dr Paul, Jess begins to understand the changes in her nan and realises she’s still the same on the inside! Jess Hiles, the inspiration for the book, has achieved so much in her life but it has not always been easy as she is disabled. Recently Jess’ own nan suffered with dementia and she found this very difficult. Jess hopes this book will help everyone (able and disabled) understand a little more about dementia and realise that it is okay to be different as we are all the same inside. 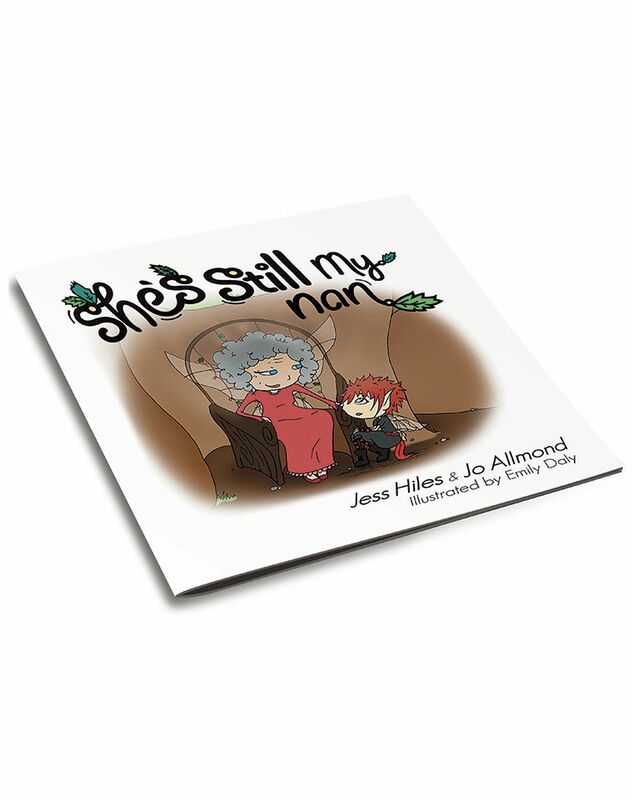 Jess, who is the inspiration for this book, although having learning and physical disabilities, lives independently in Worcestershire with support. She has achieved so much – she is a National Special Olympic gold and silver medallist, has become a member of the Peoples Parliament of Worcestershire for the disabled, helps teach sign language at a day centre and also works in a garden nursery. Jess wants nothing more than to help others, especially those less able than herself. She hopes by sharing her feelings in this book it will help everyone to know what it is like to be disabled. Jo lives in Shropshire where she now designs and makes crafts, but her career began as a ballet dancer having been privileged to dance with Fonteyn and Nureyev. Injury brought her dancing career to an early close, so she taught creative dance in mainstream schools and for 15 years ran a theatre company for able/disabled young people; this being started to help Jess and others have fun and a social life in the community. Jo’s biggest achievements in her life are her children, Tom and Jess. Take a look at the AI (Advance Information) here.